Many people believe you can’t have a stylish home if you have children. 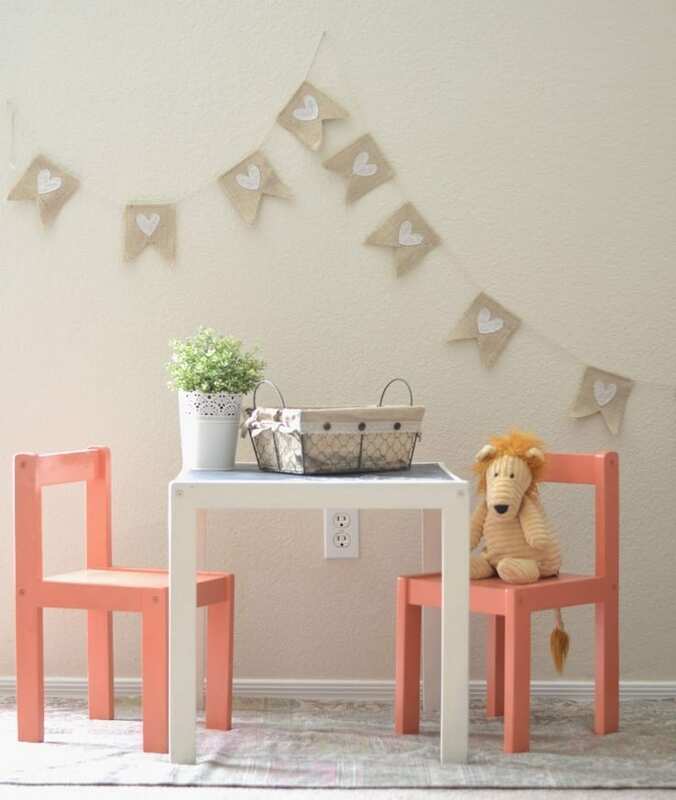 Granted, you do have to take into consideration that they will make a mess and that certain parts of the home need to be safe when they’re around, but it is possible to keep your home looking good when you have little ones. Think carefully before make decisions and purchases, and take their needs into account when you’re designing your room. You may find that the rooms need to change as the children grow, so be prepared to adapt what you have to ensure you make it as much their home as yours. From my own experience, and from research I’ve put together some ideas on what to consider when making your home child friendly, when you want to keep it looking good too. As soon as your child is able to sit at a table it’s a great idea to factor this into your home if you can. Whether it’s for eating, playing or crafting, having their own table and chairs is a great idea for encouraging independence. There are lots of great looking, stylish choices but if you can’t find what you want think about customising something inexpensive like this idea above. In terms of the bigger seating in the house, if sofa’s need replacing leave it until the children are a little older if you can. Think about wipe clean leather if the budget will run to it, or at the very least invest in removable, washable covers. If you have space for mini armchairs try them out, even little wicker ones, again you can customise them with cushions to match the rest of the décor and they’ll fit right in. If you do need to replace flooring when the children are young, as it’s quite a big investment, do take your time to consider what will work best. There are lots of options and I’ve talked about them all recently on the blog, from the pros and cons of carpet and wood flooring to how to maintain wooden flooring but with children in mind, flooring does need to be practical. Solid wood is lovely but you it will get scratched by children’s toys and need a fair bit of maintenance. Laminate flooring is a better and cheaper option, but there are also some great child friendly and cheap vinyl floors available that are really stylish and will be warm for toddler feet too. In terms of carpet, it’s probably a good idea to steer clear of anything too pale, unless you have a good protective coating added that makes it easier to clean. We’ve talked before about the value of clever storage for homes both with and without children. I have learned over the years that the better your storage the easier it is to keep your home looking great when you have children. 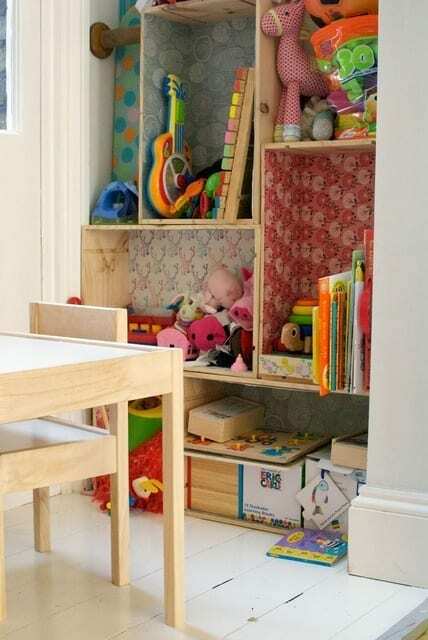 You’ll need to adapt this over the years as their toys change; when they’re little the toys are big and harder to store, but as they get older the toys become smaller and you’ll want a good storage system both in their bedrooms and in other downstairs rooms to accommodate them all. 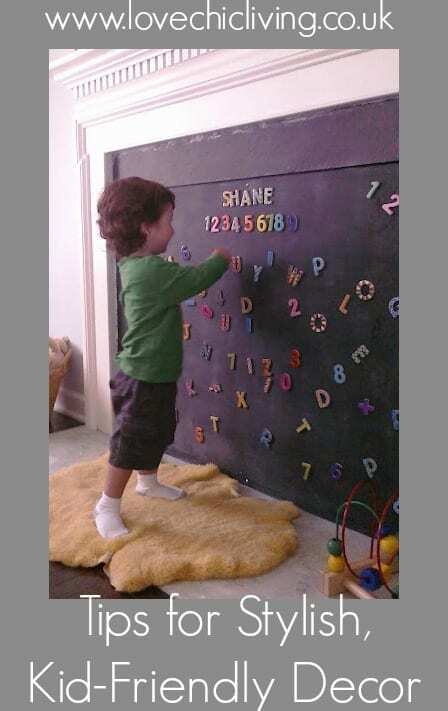 For more ideas look at this post on general home storage and this one on top toy storage ideas. Of course, the one thing we all think about, once our children begin to crawl is how to make our homes safe. Remove anything low that they can get hold of, put locks on the kitchen cupboards, safety covers on sockets, and door stoppers so they don’t jam their fingers. It doesn’t mean your home has to suffer though, you just need to be clever about the way you design it. If you don’t like the look of plastic stairgates think about either making one from wood yourself, or having one made that’s sympathetic to your decor. Don’t like traditional fireguards, how about making something like the image above that is entertaining as well as practical? As the children get older you need to consider safety in other ways like ensure bookcases and wardrobes in their rooms are properly secured to the wall. So, I hope this helps you if you’re looking at how to keep your home looking the way you like it, but also make it suitable for children too. I do believe you don’t have to sacrifice style when the kids come along, it just takes a little creativity sometimes to make a home that works for everyone. Do you agree? Do you have any other ideas? I believe you Jen, its just WHY can’t it work like this in my house! I need more time. I love those storage boxes. Some lovely ideas Jen, so pretty! Oh I love these ideas – storage ones especially. I have committed to doing Kittys room next and it’s rather small so storage is key! Love those boxes! Thank you Annie! Yep, storage is the way to go with kids’ rooms and there are some great choices available. Good luck!